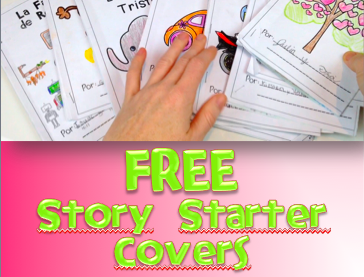 28 Story Starter Covers Freebie for 1000 FlapJack YouTube Subscribers! I’m a little late on this one, and I apologize so much! But I really wanted to do it right, and make sure it was a worthwhile freebie that truly expresses how grateful I am to you for subscribing to my YouTube channel. 🙂 If you haven’t subscribed yet, it’s easy! Just click here or on the image below, and you’ll be on your way to receiving this set of 28 Story Starter Covers (in Spanish, too!). I am having the same issues. Is there another way to acquire the story covers. I love your ideas! And thank you! Love these! Thank you for the freebie! !